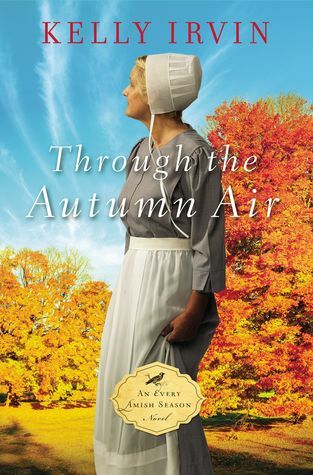 Today I am reviewing Through the Autumn Air, the third book in the An Every Amish Season series by Kelly Irvin. A mysterious English stranger appears in Mary Katherine Ropp’s kitchen one autumn night, heralding the beginning of a new chapter in the widow’s life. The mother of ten, Mary Katherine is an empty-nester who lost her husband four years earlier. She misses her husband so much, she still talks to him. She pours her creative spirit into writing stories and serves as the district’s Budget newspaper scribe. An avid reader, her dream is to open a bookstore with her English friend, but the church elders want this wayward widow to work in an Amish-owned combination store. When an English man breaks into her house looking for food, Mary Katherine doesn’t call the sheriff. She turns to her good friend, Ezekiel, who needs a cook at the restaurant he started after his wife died ten years earlier. Mary Katherine and Ezekiel set out separately to make sure their new friend isn’t caught up in the investigation, and their efforts keep bringing them together. They’re both still so in love with their long-gone spouses, so when the sparks begin to fly, they are beyond confused. Is it possible to find “The One” more than once in a lifetime? But as Mary Katherine stands by her dear friend after the death of her husband, Mary Katherine is reminded of the terrible risk in giving her heart to someone. Can these two people, well-versed in the pain of loss, put the past behind them and trust in the hope of the future? Through the Autumn Air is an awesome read! I love the interaction between Mary Katherine and Ezekiel; they’re like teenagers again. And I hate to admit it, but I for sure didn’t like how Thomas felt like he could boss her mother around. Even if he’s a wonderful husband and father, he’s not a respectful son — and it’s not right. He didn’t show respect for his mother when he ordered her to do things his way. Okay, other than him, I loved the story… and I hope there’s more about Burke in the last story of this series. Nice review of Through the Autumn Air. I want to read this one. I have not read a Kelly Irvin book yet and I’ve heard a lot of great things about them. I must check them out soon!